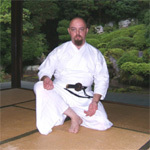 Iwanami-the 6th Hasagawa Eishin ryu kata. This is a sample of an iaido kata from Musoshindenryu-I have included it here in case anyone does not really know what an iaido kata is! 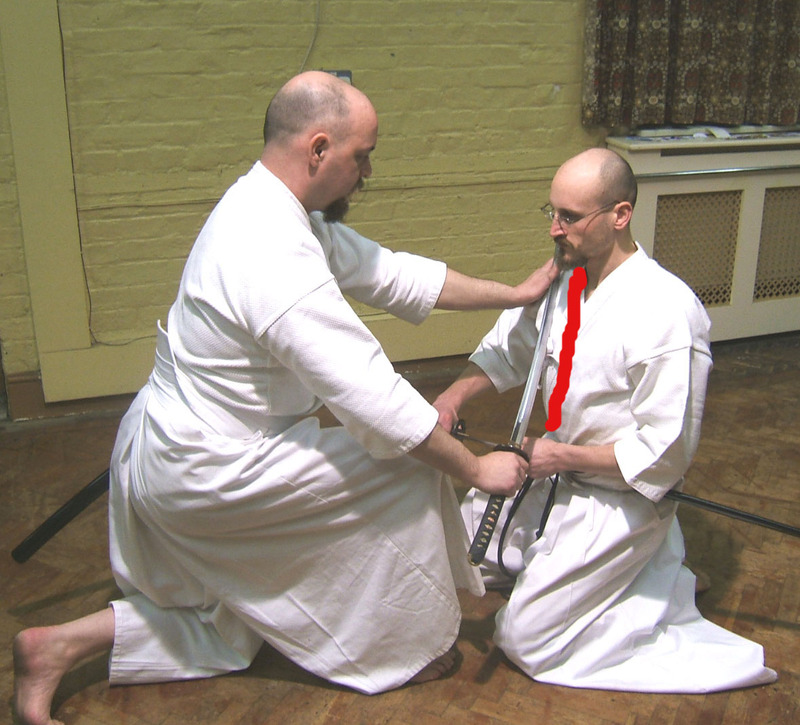 Iwanami is the 6th Hasagawa Eishin ryu kata taken from Musoshinden ryus Chuden or ‘middle level’ sometimes reffered to as ‘tatehizanobu. Eishin ryu was added to MSR by the 7th grandmaster-Hasagawa Hidenobu(Eishin). ‘Iwanami’ translates as ‘rock and wave’. 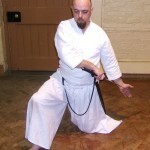 This is a common name for koryu techniques in many schools, both armed and unarmed, as the interplay between water and stone can reflect many different strategies. It can also be translated as ‘waves against the cliff’. 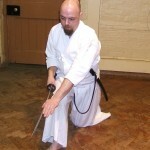 In this kata you cut the opponent to your right a number of times, using four different cuts. 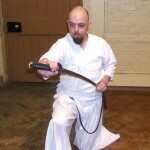 Begin facing the front(pic 1) with your left thumb covering the tsuba. 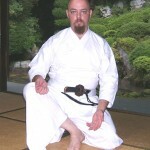 It is important that the thumb grips the tsuba tightly at this point, and is not merely resting on the sword guard, for a number of reasons. If one were to bend forward the sword could fall to the ground causing damage or injury, if it is not firmly secured. 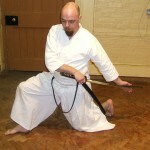 I once saw a student, who was training with a live blade, lean forwards to pick something up with his right hand. The sword began to fall out of the saya, as he had not secured it, and his natural action was to bring his left thumb down on the blade. As you might imagine, the student lost some blood that night. He secures his tsuba securely at all times now! From a historical point of view an opponent can grab a sword which is not secured, and Iaido instructors take great delight in grabbing unsecured swords from their students! Turn to your right and assume tatehiza. (pic 2&3) It is normal, but not universal, for your hands to be partially open-palms uppermost, and your sageo(if used) to be left hanging down the middle, however sometimes the sageo is placed to the left. The knees should be pushed out with most of your weight on the instep of your left foot. In the third picture my right foot is flat on the floor, but would normally be on its outside edge. This differs somewhat from the straighter position adopted in Seitei’s tsukaate. Your opponent is sitting to your left and is usually thought to be facing the same way as you. As your opponent begins to rise you spin to your left and draw the sword towards your enemy. Ones eyes should precede this rotational movement. (pic 4) This should be done with an upwards motion to provide some protection and to reflect the fact that the enemy is close to you. The usual explanation for this movement is that you push the entire sword though the opponent using your left hand on the mune to drag the sword back through the opponent, cutting with a pulling action. 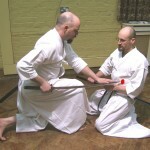 (pic 5 ) The tsuba should be brought back to your right hand side and your right foot should be brought back a little at the end of this move(pic 6). 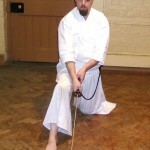 Sometimes this action is taught as a high block to your opponents sword or a cut to his arms. I have also seen this action taught as merely a draw. Next thrust the kissaki (point) of the sword into the opponents abdomen(pics 7 & 8) or solar plexus using the right hand. The left hand is used as a guide here. The cut has a forwards motion and is pulled out afterwards. The next cut is made by bringing the sword round to the left(pic 9) and driving the sword up through the opponents body as you turn the body to the right. (pic 10) Again this is done with the right hand whilst the left hand pushes the mune through. 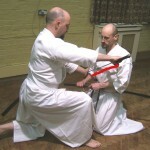 The left hand moves towards the tsuba as the cut is made. 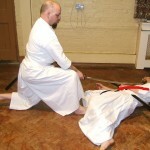 (pic 11) This cut is made either to the opponents body, or to their back depending on circumstances. When executing this cut it is important to drive through strongly pushing the opponent as you cut. How far you cut up depends on the teacher. In the Kuroda method the initial cut upwards is very high when compared to other schools. When you finish executing this cut bring the sword back down to the left(pic 12) prior to bringing it above your head into a high guard position. 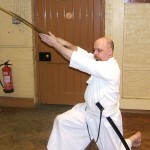 Follow this by executing a strong kirioroshi vertical cut through your enemy. (pics 13 & 14) A loud high stamp with the right leg (which should be forwards) usually precedes this cut, signifying that you are pinning your opponents arm to the ground prior to finishing him off. Next complete yoko-chiburi, shaking the blood off to the right. (pic 15) This action, although largely symbolic, should be done with the intent of shaking the blood and bits off your sword. The idea of this action is to make sure that your katana does not become stuck in the scabbard, leaving you vulnerable to an attack. In reality the sword would be wiped clean-probably on the enemies clothes, or with a piece of cloth-prior to resheathing. Next, complete noto by bringing the sword back , followed by bringing the sword forwards and the saya back. 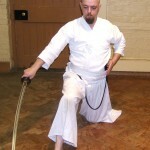 In Musoshinden ryu the blade remains horizontal during the first stage, turning a third of the way through the second stage. 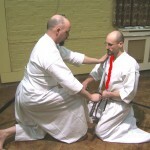 In Chuden the koiguchi meets the mune further down the sword than in Omori ryu in most dojo. 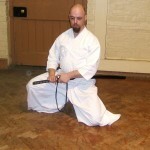 In the final stage of noto you resheathe the blade as you kneel down slowly resheathing the blade whilst turning the saya clockwise back to the vertical, as you move your body and right knee round to the right. (pic 16) Stand up by moving your right foot forwards and your left leg up. You should still exhibit zanshin. Pause and relax your right hand and move back to your starting position. It is important to relax the hand slowly-this reflects the fact that you are in control of the speed of the kata at this point as the opponent no longer impacts on the speed that you move. Before you relax your Zanshin or awareness relax your eyes moving them away from your foe. 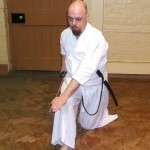 Why is the Sageo removed in Seitei but used in Musoshinden ryu and other styles? 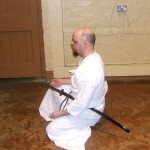 The sageo is not normally removed for Seitei Iaido as Sageo control methods are now part of Seitei Iaido. 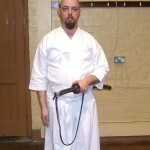 Some Iaido Sensei from Japan chose not to use sageo in the 1960s and this they have passed on to their students. I my opinion the sageo is usefull to retain the saya, but also has uses in restraining oponents, and other more unpleasant applications. Regards, Chris.